Annnd I’m back after unannounced summer break. Have you ever just wanted to cut out all distractions and soak up the last bits of summer, and then your computer dies, and then your camera dies, and then your computer dies again? That happens to people right =). These cookies remind me of running cross country in the fall and sitting in the back of the bus going to away meets. See, H and I would always make cookies for the team when we were traveling. We’d meet at her house the afternoon before the big day, after an easy or no practice and bake up a storm. One time while gathering all of the ingredients she took out the almond extract instead of vanilla. I was shocked and a little taken back. A wise one that H.
In a large bowl or standing mixer beat butter, sugar, and baking powder until fluffy. Add in the egg, almond milk, and almond extract and beat until well combined. Beat in as much flour as you can. (At this point I started a raise an eyebrow… as much as I could? What about the rest?) The original recipe said after you couldn’t beat anymore, to just stir the rest in. The dough was looking a little dry so I added a little more milk and continued to use my mixer haha. Cover and refrigerate the dough for at least 30 minutes. Preheat oven to 375. Divide the dough in half so you can work in batches. Sprinkle a large cutting board with a little bit of flour. Take the first half of the dough leaving the second in the fridge, roll out the dough until it’s about 1/8 in thick. 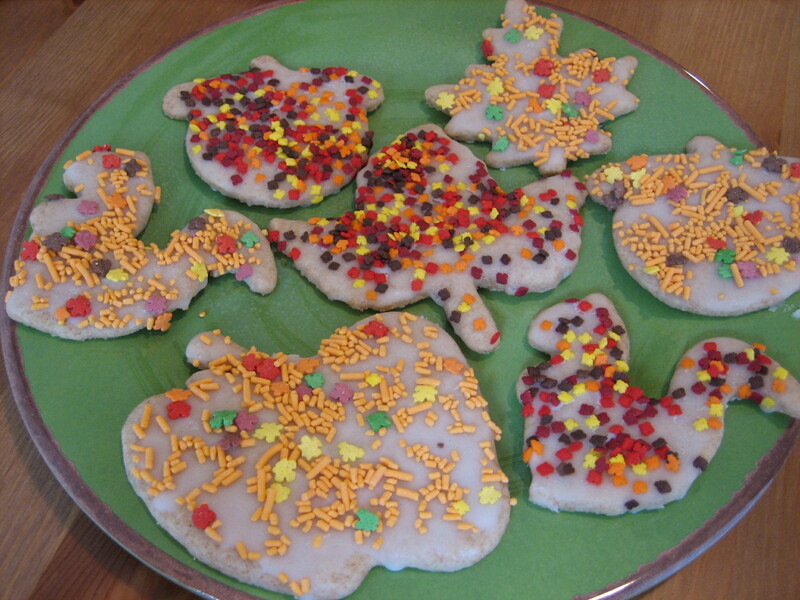 Using your favorite fall cookie cutters cut the dough in shapes! Carefully place on an ungreased cookie sheet and bake 7-8 minutes. Place the unused dough back in the fridge and repeat with the second half. When cookies are done transfer to a wire sheet and let cool. Perfect time for the icing. In a bowl whisk together powdered sugar, almond extract, and the almond milk. 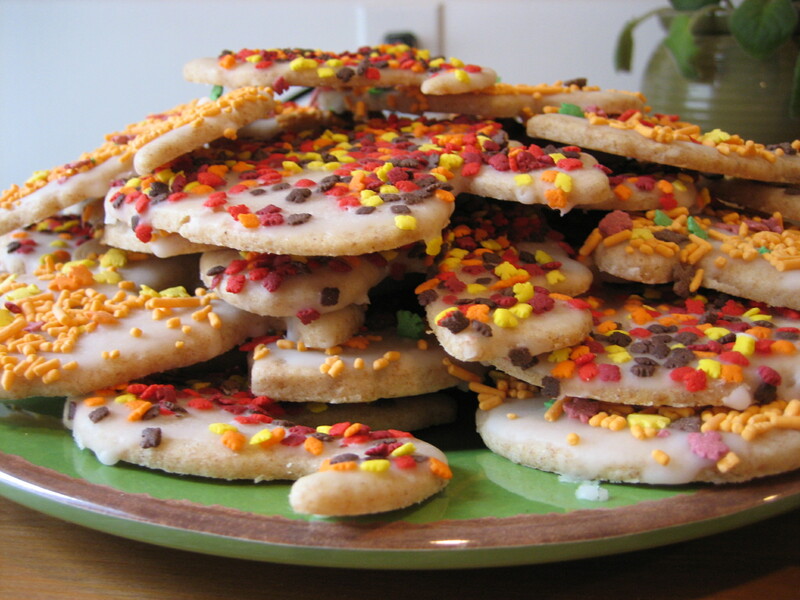 Once the cookies have cooled completely, brush with icing and sprinkle festively!